House at 222 West Ninth St.
House at 323 West Eighth St.
Photo: Period Revival House, ca. 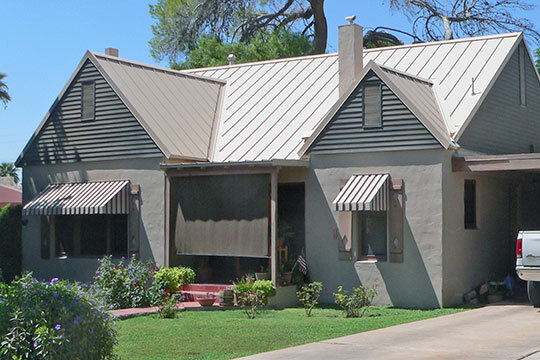 1927, 905 North Lehmberg Avenue, Casa Grande, AZ. Listed on the National Register of Historic Places in 1985. Photographed by User:Ammodramus (own work), 2013, [cc-by-1.0 (creativecommons.org/publicdomain/zero/1.0/deed.en)], via Wikimedia Commons, accessed November, 2013. Pinal County administrative offices are located at 31 North Pinal Street, Florence, AZ 85132; phone: 520-509-3555. Pinal County was created in 1875 from parts of Maricopa and Pima counties. Pinal County is one of the largest counties in Arizona at 5,386 square miles, which is larger than the state of Connecticut (4,845 square miles). Like most of Arizona, the County has and continues to experience tremendous growth. The rapid growth over the past two decades has been attributed to abundant, low-cost, land for development and relatively inexpensive commutes into employment centers in the Phoenix and Tucson metropolitan areas. Farming and horses have historically been a valued part of Pinal County's heritage. Thousands of acres are still in agricultural production today. However, Pinal County is experiencing a transition from tractors to tricycles at a rapid rate as farmland is sold for residential development. This transition is occurring for a variety of reasons that include desirability of living in Pinal County and the relatively few housing choices that have existed in this area, the cost of water, global competition, and increasing land values. However, many still choose to live in Pinal County because of the agricultural and equestrian heritage. We Create Our Future: Pinal County Comprehensive Plan, 2009, www.pinalcountyaz.gov, accessed November, 2013.